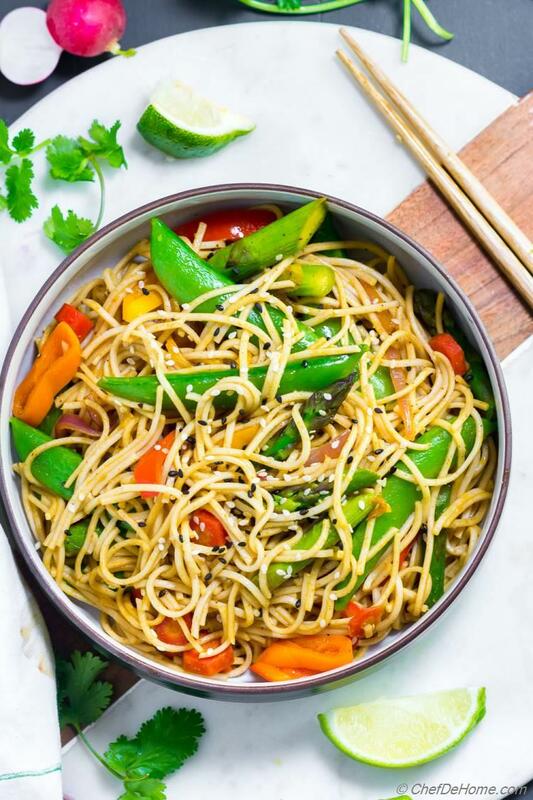 Let's bring all those crunchy vegetables, lite soba noodles and bold spices together to make a vegetable stir fry just like takeout! 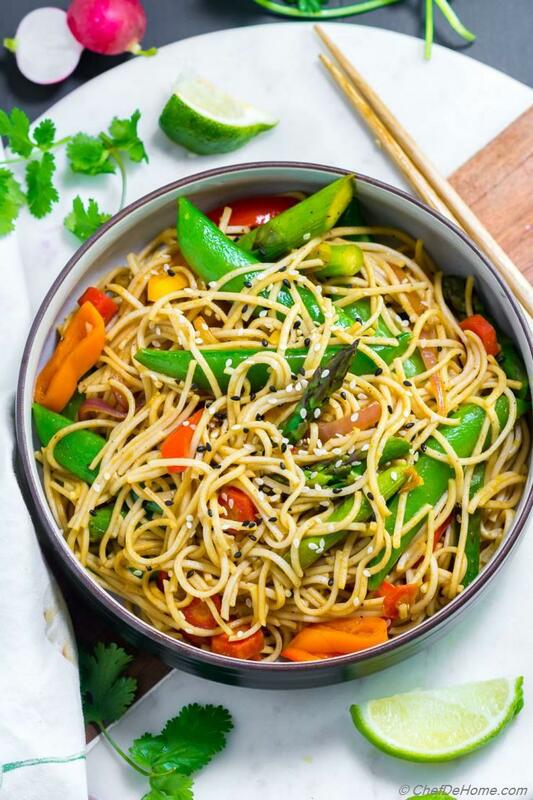 Spicy Soba Noodles and Vegetables stir fry makes perfect quick dinner for Friday, or any day when I want 15 minutes or less in kitchen. Soba noodles cook quickly. 5 minutes stir-fry in wok (or regular saute pan) and takeout style dinner at home. Lite, loaded with crunchy veggies, and amazing sweet and spicy flavor. yumm! 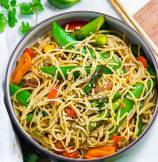 Vegetable and Noodle stir fry are very flexible meal options. Like 1) Use any veggies you prefer, 2) Add less veggies or no veggies but shrimp or chicken, 3) Make less spicy or more spicy. 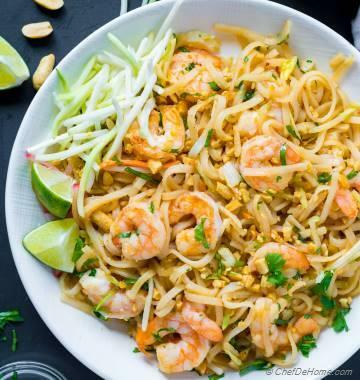 Really, these noodles are perfect to make-your-own. No matter what you decide, I highly recommend use Soba noodles only and use the spice-seasonings in this recipe. Before we continue, shout out for my favorite Soba Noodles Recipes on blog. If you like Soba and Asian Noodle bowls, I'm sure these will make you very happy. 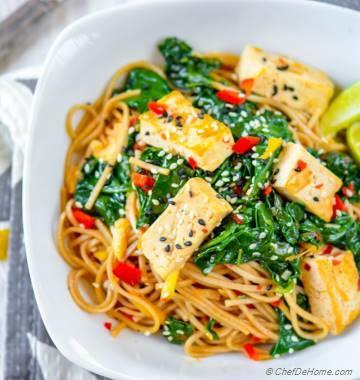 Soba Noodles with Spinach and Coconut Tofu. In my honest opinion, every Asian noodle bowl needs bold flavor and spices. Even if it does not, I'll add some because no one will eat dull food in my family. Specially if it is loaded with veggies, bold flavors are must have for my picky eaters. When I'm looking for pop of flavors for Asian Noodles Stir Fry, I reach to one trusty spice blend in pantry - Curry Powder. Mild to spicy, I keep wide variety of curry powders to produce bold-flavor dish at moment's notice. For this Spicy Noodles recipe, I decided to go sweet and spicy. Over all flavor of these noodles is not way spicy. It is perfect medium balance of spice and sweet. If you can't find pr don't have curry powder, I recommend using a mixture of cumin, coriander or Chinese five spice. This powder is to give spice to the noodles not to add heat. For heat I used diced kimchi and sambal - chili garlic paste. Kimchi (Korean Fermented Cabbage) is second after yogurt in my refrigerator which we eat everyday with dinner. It tastes good, is spicy, crunchy and so good for gut. 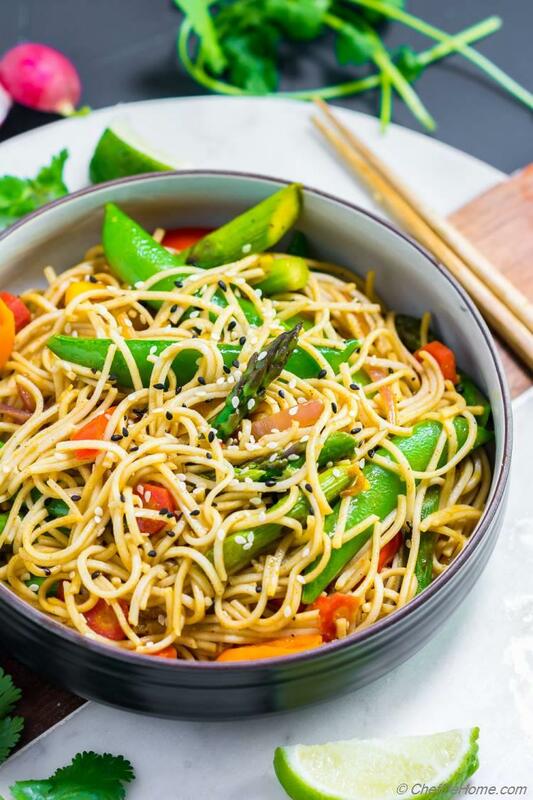 Vegetable stir fry is very easy to prepare at home. You don't need a special wok to stir fry, saute pan works fine. In restaurants, they use iron metal or copper woks because these are good conductor of heat. At home with regular pan, just make sure to heat pan really hot. The heat of pan sears veggies on contact, making veggies just enough crisp and tender. 1) Heat - Heat pan well before adding veggies. Veggies should sizzle on contact with oil. 2) Cut of Veggies - Cut veggies little big in size. Leave small vegetables whole such as snow peas, asparagus (cut lengthwise). Cut carrots, bell pepper diced to big pieces. In short, thick cut vegetables will not get mushy. If a vegetable is very delicate like leafy greens. Add them right at the end. 3) Pan Size - Use a wide pan to make stir fry. Wide pan has more surface area which will sear all veggies evenly. If pan is small and veggies are crowded, instead of crisping up these get mushy in steam. Follow above three to enjoy a homemade Vegetable Stir Fry made to perfection. Just like pros. When stir frying noodles with veggies, I make sure to let noodles get some caramlization in wok. Then add seasonings. 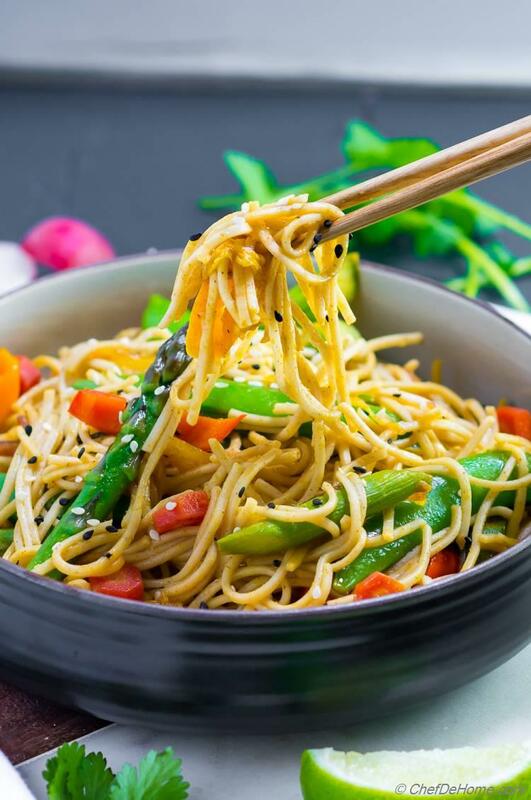 It is important to add wet seasonings such as soy sauce, lime juice or vinegar on the noodles at end instead of beginning. This way, noodles will absorb seasoning from soy, vinegar making noodles very flavorful. 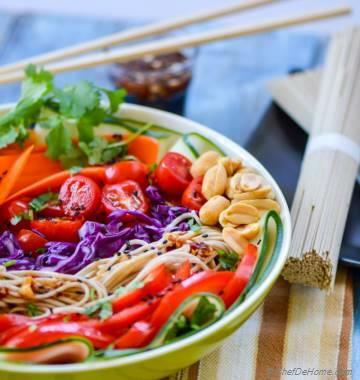 Friends, this noodle bowl is full of my favorites which I'm sure you all will like. Lite Soba noodles, lots of crunchy vegetables and spicy flavorful combination of curry powder and kimchi. A wholesome bowl for perfect weeknight dinner. Plus leftovers great for lunch (soba noodles don't mush together and stay good 8-10 hours). This week we went the Asian route. Have you checked Ramen Salad with Miso-Peanut Dressing yet? Smart Swap For serving of protein, saute shrimp, tofu or white meat chicken with veggies. 1. Cook soba noodles according to package directions. Mix soy sauce, sugar, 1 tablespoon lime juice, liquid of kimch in a bowl and set aside. 2. Meanwhile, in a saute pan, heat 1.5 tablespoon of cooking oil until it is smoking hot. Stir often, don't let garlic burn. Don't add any liquid when stir fry veggies or steam make veggies mushy. 4. Add Soba noodles into veggies and cook stirring for 30 seconds. Now, add soy sauce-sugar-lime juice mix prepared in step - 1. Cook noodles coating in sauce and veggies for 1 more minute or until liquid almost all evaporates. Take off heat. Season with remaining lime juice, salt and black pepper to taste. 5. Transfer into bowls, garnish with sesame seeds. Serve with lime wedges on side. Enjoy. We love generous splash of lime juice and even some sriracha (for extra kick). Use a wide saute pan to cook veggies crisp tender. *Note:You can check the brand of Soba Noodles and Kimchi I used for this recipe on my Amazon Shop List. Follow link from suggestions below.